Instructions: Prepare a white card base of 5 1/4 x 7 1/4", use the largest die in the Eyelet Rectangle & Basics die and cut a piece of red cardstock and adhere on top of the white. Using the Intricate Swirl Frame die, die cut with the white cardstock, add Foam Dots to the back and adhere to card. Cut a piece of the O Holy Night paper from the paper collection, add foam dots and adhere to card. Stamp the images, leaves and flowers on white card stock with Jet Black Ink. Using the colors of your choice color everything. Using matching dies, cut everything out. 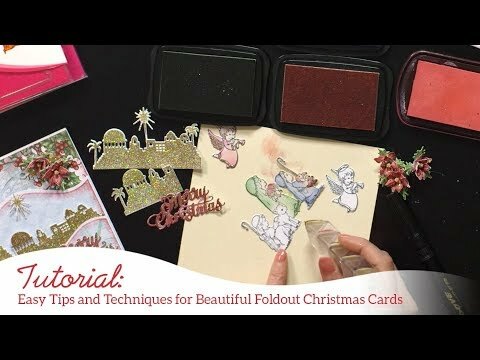 Place the flowers and leaves in the Poinsettia Shaping Mold, spritz with water and run through your die cut machine, finish shaping with the Deluxe Flower Shaping kit, add Stamens in the center and place in the lower 2 corners of the card. Add foam dots to the back of all the images and adhere to card as shown. To finish add glitter to the images, flowers and leaves.